Caeneressa syntomoides Rothschild comb. n.
Eressa syntomoides Rothschild, 1912, Novit. zool., 19: 123. 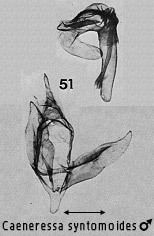 Eressa syntomoides hosei Rothschild, 1912, Novit., zool., 19: 124. Eressa syntomoides Rothschild; Seitz, 1912-1913: 85. Diagnosis. See Caeneressa leucozona Hampson. On the forewing there is a large discal patch, and a smaller one in the spaces posterior to the major distal ones of leucozona. The species is rather small compared with its closest Bornean relatives. The specimen illustrated has the white markings more extensive than in typical syntomoides or hosei. Habitat preference. Recent material from Brunei is from lowland forest in the Labi area and Ulu Temburong; the type series of hosei is from G. Dulit.